A firefighter examines the flames as a fire sweeps through Bucyrus, N.D., on Wednesday night. When a grassfire destroyed most of tiny Bucyrus, N.D., this week, the "perfect firestorm" of conditions served as a reminder that the long-term drought, combined with unpredictable winds, makes for severe fire danger across the central U.S., even in the middle of autumn. 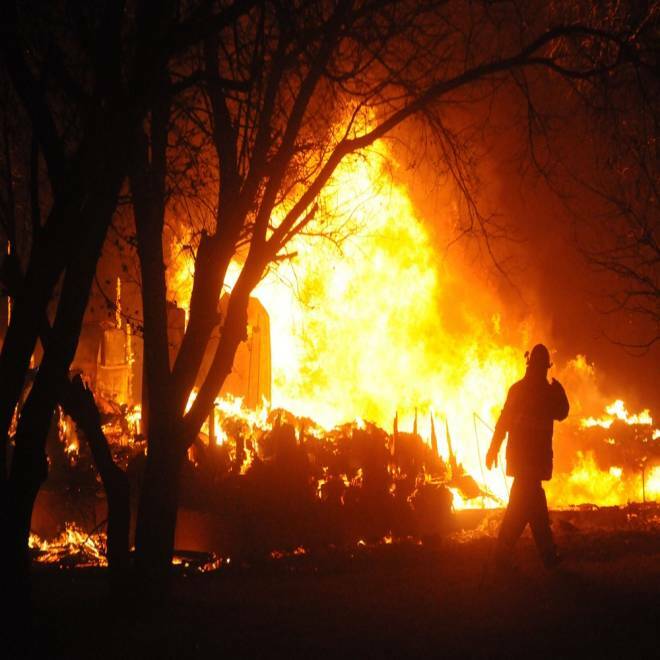 Four homes and 20 other structures were lost after the fire broke out Wednesday afternoon. Fanned by winds up to 70 mph, it consumed at least 6,000 acres and traveled 10 miles by Thursday morning, The Dickinson Press reported. "This is like a nightmare," Linda Wiskus told The Dickinson Press. "I wouldn’t wish this on anyone. ... We had about 15 minutes to get what we could. I grabbed a safe, a pair of jeans and some socks — I didn’t have time to get anything else." The cause of the fire has yet to be determined, but Bucyrus is in a county that's been in continued drought since October 2011, Adnan Akyuz, North Dakota's state climatologist, told NBC News. Conditions got even worse starting Oct. 2. "When you combine warm, dry and windy conditions, it creates a perfect setting for elevated fire danger," Akyuz noted. Adding drought to that mix, he said, "makes it more dangerous conditions for fire." "Red flag" fire warnings have been issued "frequently this summer and fall in the area," he added. Located in southwest North Dakota, the county has also had the lowest amount of precipitation in the state over the last two months. While about average for the last decade, the number of wildfires across the state this year is higher than the three previous years, which saw lots of rain and flooding, said Cecily Fong, a spokeswoman for the state's Department of Emergency Services. "Typically, the southwest corner and western part of our state are more prone to wildfires, but they can really occur anywhere if we go into severe drought, which we think we may be doing now," she told NBC News. A top meteorologist at the federal command post for fighting wildfires said the time of year, combined with the dry grass, wind and drought made for prime fire conditions in North Dakota. "People burning leaves" this time of year is another worry, Ed Delgado, of the National Interagency Fire Center, told NBC News. But he was also hopeful the fire season would see a "very quick decline" as it gets colder and wetter. Akyuz said putting out North Dakota's 2012 fire season "all depends on the snow cover." "Our winter snow cover lasts from November through March," he added. "Even though it may be a dry winter, it is unlikely that the entire winter will be snow free." For some of the 27 residents of Bucyrus, that's little comfort. Evelyn and Mike Krug were among those who lost their home, The Dickinson Press reported. Asked what she and neighbors might do next, Evelyn shook her head and said only, "I don't know."